Creators that want to build interactive video applications have largely been constrained by the lack of easy-to-use tools for doing so. Today those publishers can either use rudimentary tools like YouTube annotations (s GOOG) to extend an element of choice to video applications, or they can turn to expensive, custom web design firms to build that interactivity into their videos. Now one startup is looking to provide an alternative: Boulder, Colo.–based Flixmaster offers a platform for publishers like transmedia creators and interactive advertisers that provides most of the functionality that they desire, without requiring them to shell out tens or hundreds of thousands of dollars to build custom experiences. 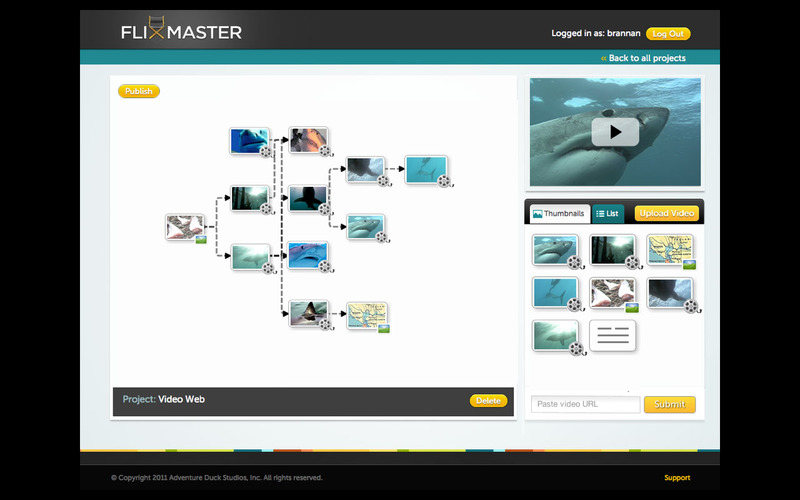 Flixmaster’s platform includes a drag-and-drop interface that allows viewers to drag icons between video thumbnails and create “branching” connections between clips. Flixmaster thus creates a structure for the videos and auto-populates them with interactive buttons that viewers can choose between while watching a video clip. Users of the Flixmaster platform can edit and customized them to change their in and out points, look and feel, positioning and text of the buttons. Founder Cameron McCaddon, who previously worked in casual and online gaming, said the startup wanted to make sure from the beginning that it would be “really, really easy to use.” Hence the drag-and-drop interface. But if a user wants to get more creative in building an interactive story line, Flixmaster offers more-advanced customization. Interestingly enough, the video experiences that Flixmaster creates are built in HTML5, with Flash (s ADBE) used only as a fallback option when an HTML5 player isn’t available. The decision to go with HTML5, according to McCaddon, was made in part because the firm expects mobile viewing to become huge over the coming years. Because Flash isn’t available on Apple iOS devices (s AAPL) like iPhones and iPads, the Flixmaster team made a bet on HTML5 instead. For Flixmaster, it was a decision between building for now or building for the future. 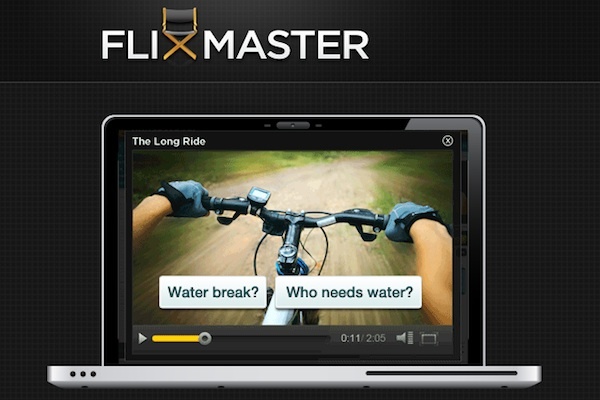 Flixmaster is currently in beta testing, with about 75 clients using its platform. It’s still working on its pricing, but it expects to create a group of tiered pricing plans that will depend on available features, number of videos uploaded, depth of analytics and number of users per account. The startup has five full-time employees (and some contractors), and it is being bootstrapped using an initial $250,000 investment from a group of angel investors. Flixmaster is part of the current class of startups in the TechStars Boulder incubator, which has its demo day this Thursday. Wouldn’t it make sense to embed a video to show capabilities? Isn’t this a little like http://interlude.fm/ ? If users are interested in signing up for the beta, please click the sign-up button and apply for a beta password. We will be issuing passwords on a rolling basis. Thanks for the interest! We look forward to your feedback! I’m interested in signing up for the beta, but I don’t see a sign-up button… perhaps you could provide a link? Sure! Go to http://www.flixmaster.com/ and click on the big blue button that says “Sign Up.” This will register you to receive an access code. Thanks for the follow up!